The Learning Academy (TLA) at the University of South Florida is a 30-week transition program for individuals with autism spectrum disorder (ASD) between the ages of 18 and 25. The program provides services, supports, and experiential opportunities, with the aim of enhancing skills that will prepare students to succeed in the workplace and postsecondary education settings. The Institute for Community Inclusion (ICI) at the University for Massachusetts Boston conducted a one-year evaluation of TLA to explore its essential programmatic elements, and the ways in which the experience influenced student transformation. The evaluation included a thorough observation of program structure, curriculum, daily practices, and history, as well as detailed interviews with TLA staff, students, parents, mentors, and external collaborators. The findings showed that TLA influenced students’ personal growth and transformation, manifesting in a newfound self-confidence. At the end of the program, students described themselves as having greater self-awareness, self-esteem, independence, preparedness, and social competence. 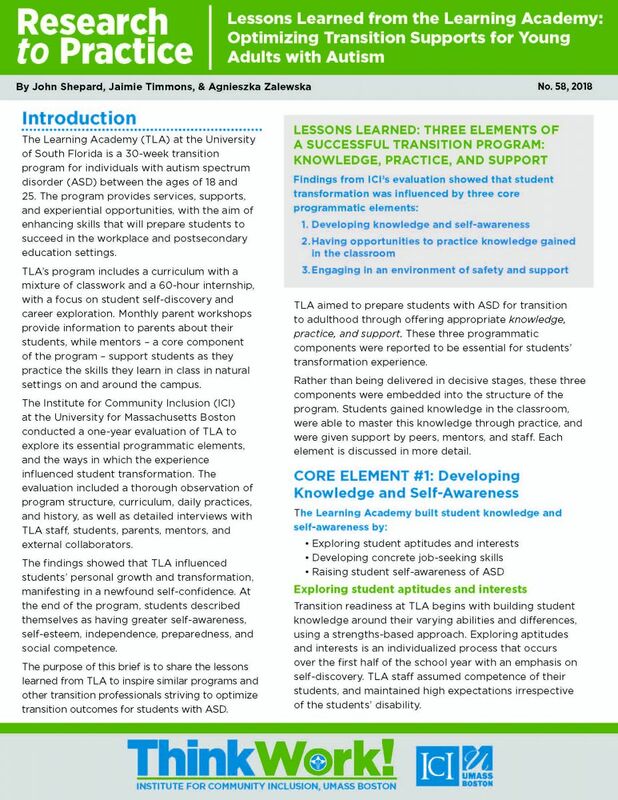 The purpose of this brief is to share the lessons learned from TLA to inspire similar programs and other transition professionals striving to optimize transition outcomes for students with ASD.